New Nature, STEM-Based Camps Available During Spring Break At The Dallas Arboretum! You are here: Home / Dallas/Fort Worth Events / New Nature, STEM-Based Camps Available During Spring Break At The Dallas Arboretum! Registration is now open for brand new nature and STEM-based (science, technology, engineering and math) camps, scheduled for weekdays, March 7 through 18 at the Dallas Arboretum. Organized by grade level, camps are catered for children based on age and interests to create an unforgettable camp adventure in the garden. Classes are led by experienced Arboretum teachers and are held rain or shine. 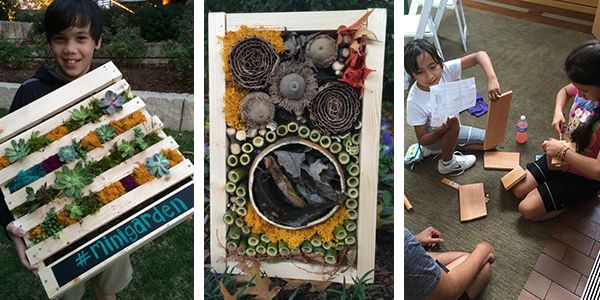 Spring break camps are new for the Dallas Arboretum and are a great way to combine science and nature with endless fun during students’ vacation time. Camps fill up quickly, so guests are encouraged to register online today. For children ages 3 to 5 with one parent, this camp is specially designed for the littlest of nature lovers. Through hands-on science explorations, song and movement and garden discoveries, campers will explore the amazing life cycles of garden creatures and discover the fascinating world of earthworms. Parents can choose a morning or afternoon session. For specific dates and times, please visit www.dallasarboretum.org or call 214.515.6515. This camp invites kindergartners through 4th graders to investigate nature while exploring the beautiful garden as spring blooms. Campers will discover the secrets of nature while participating in hands-on science activities, nature walks, take-home science-themed projects and more. Each day of camp offers a different adventure, designed specifically for each grade level. Prices and times vary. For specific dates and times, please visit www.dallasarboretum.org or call 214.515.6515. A series of brand new, STEM-based classes, specifically designed for 5th through 8th graders, allow campers to explore the beautiful gardens, discover natural wonders and bring home a nature-inspired project. With 10 hashtag-themed classes to choose from, including #Plants2Dye4 and #InsectHotel, campers discover a fun way to learn. Classes are $55 ($50 for Members), and dates and times vary. Special class packaging rates are available. For specific dates and times, please visit www.dallasarboretum.org or call 214.515.6515. For more information on spring break camps including all exact dates and times, frequently asked questions and to register online, visit http://www.dallasarboretum.org/education/summer-camps, contact [email protected] or call 214.515.6515.